petición: Support MSF's call to immediately evacuate asylum seekers and refugees from Nauru! Support MSF's call to immediately evacuate asylum seekers and refugees from Nauru! I support the call by Médecins Sans Frontières (MSF) for the immediate evacuation of all asylum seekers and refugees from Nauru and for an end to the Australian offshore detention policy. 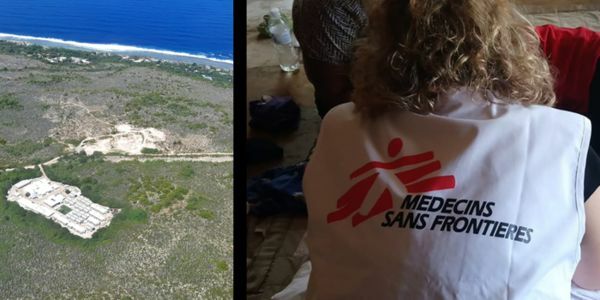 After almost one year of activity on Nauru Island, Médecins Sans Frontières (MSF) was informed on 5th of October by the Government of Nauru that our mental health activities were 'no longer required' and that our activities should cease within 24 hours. The mental health situation of refugees on the island is beyond desperate. We strongly condemn the Australian policy of indefinite, unfair offshore detention which is the real cause of the situation of mental health distress among refugees and asylum seekers on the island. "We were particularly shocked by the many children suffering from traumatic withdrawal syndrome, where their status deteriorated to the extent they were unable to eat, drink, or even walk to the toilet." – Dr Beth O'Connor, MSF psychiatrist. If you support MSF's call, add your voice today. Sign and tell Home Affairs Minister Peter Dutton, Immigration Minister David Coleman, Shadow Immigration Minister Shayne Neumann, and Opposition Leader Bill Shorten that all asylum seekers and refugees must be immediately evacuated from Nauru and bring an end to the Australian offshore detention policy. MSF has released the first independent medical data demonstrating the extreme mental health suffering on Nauru, due to the Australian policy of indefinite offshore processing. According to the report, Indefinite Despair, the mental health suffering on Nauru is among the most severe MSF has ever seen around the world. If you share our concern, please continue to share this petition.